CB1 mRNA transcripts are abundant in GABAergic interneurons of the hippocampus, indirectly reflecting the expression of these receptors and elucidating the established effect of cannabinoids on memory. These receptors are densely located in cornu ammonis pyramidal cells, which are known to release glutamate. Cannabinoids suppress the induction of LTP and LTD in the hippocampus by inhibiting these glutamatergic neurons. By reducing the concentration of glutamate released below the threshold necessary to depolarize the postynaptic receptor NMDA, a receptor known to be directly related to the induction of LTP and LTD, cannabinoids are a crucial factor in the selectivity of memory. These receptors are highly expressed by GABAergic interneurons as well as glutamatergic principal neurons. However, a higher density is found within GABAergic cells. This means that, although synaptic strength/frequency, and thus potential to induce LTP, is lowered, net hippocampal activity is raised. In addition, CB1 receptors in the hippocampus indirectly inhibit the release of acetylcholine. This serves as the modulatory axis opposing GABA, decreasing neurotransmitter release. Cannabinoids also likely play an important role in the development of memory through their neonatal promotion of myelin formation, and thus the individual segregation of axons. CB1 receptors are expressed throughout the basal ganglia and have well-established effects on movement in rodents. As in the hippocampus, these receptors inhibit the release of glutamate or GABA transmitter, resulting in decreased excitation or reduced inhibition based on the cell they are expressed in. Consistent with the variable expression of both excitatory glutamate and inhibitory GABA interneurons in both the basal ganglia's direct and indirect motor loops, synthetic cannabinoids are known to influence this system in a dose-dependent triphasic pattern. Decreased locomotor activity is seen at both higher and lower concentrations of applied cannabinoids, whereas an enhancement of movement may occur upon moderate dosages. However, these dose-dependent effects have been studied predominately in rodents, and the physiological basis for this triphasic pattern warrants future research in humans. Effects may vary based on the site of cannabinoid application, input from higher cortical centers, and whether drug application is unilateral or bilateral. A CB1 receptor knock-out mouse study examined the effect that these receptors play on exploratory behavior in novel situations. Researchers selectively targeted glutamatergic and GABAergic cortical interneurons and studied results in open field, novel object, and sociability tests. Eliminating glutamatergic cannabinoid receptors led to decreased object exploration, social interactions, and increased aggressive behavior. In contrast, GABAergic cannabinoid receptor-knockout mice showed increased exploration of objects, socialization, and open field movement. These opposing effects reveal the importance of the endocannabinoid system in regulating anxiety-dependent behavior. Glutamatergic CB1receptors not only are responsible for mediating aggression but produce anxiolytic-like function by inhibiting excessive arousal, which prevented the mice from exploring both animate and inanimate objects. In contrast, GABAergic CB1 receptors appear to control an anxiogenic-like function by limiting inhibitory transmitter release. Taken together, these results illustrate the regulatory function of the CB1 receptor on the organism's overall sense of arousal during novel situations and suggest that investigatory drive is associated with impulsive behavior. The CB1 receptor inverse agonist rimonabant has been found to reduce intake of food or sweet solutions in both humans and mice. Targeting this receptor with rimonabant has been found to prevent the THC-induced enhancement of DA release in the nucleus accumbens shell from food, suggesting that these receptors may be involved in determining the hedonic value of food. In addition, CB1 facilitates ghrelin release, normally happening when the stomach is constricted In the presence of a relatively active system, overeating is promoted. This is the genesis of its appetite-stimulating effects, colloquially called "the munchies." Several recent reviews on CB1 receptors and addiction have indicated that CB1 receptor activation reinstates drug seeking behavior in addicts. In humans, this results from the influence that limbic CB1 receptors have on mesolimbic dopamine neurons, specifically dopamine receptors in the nucleus accumbens. As a consequence, CB1 receptor antagonists can reduce drug seeking behavior in some addicts. Selective CB1 agonists may be used to isolate the effects of the receptor from the CB2 receptor, as most cannabinoids and endocannabinoids bind to both receptor types.CB1 selective antagonists are used for weight reduction and smoking cessation (see Rimonabant). A substantial number of antagonists of the CB1 receptor have been discovered and characterized. TM38837 has been developed as a CB1 receptor antagonist that is restricted to targeting only peripheral CB1 receptors. ^ a b c Abood M, Barth F, Bonner TI, Cabral G, Casellas P, Cravatt BF, Devane WA, Elphick MR, Felder CC, Herkenham M, Howlett AC, Kunos G, Mackie K, Mechoulam R, Pertwee RG (22 August 2018). "CB1 Receptor". IUPHAR/BPS Guide to Pharmacology. International Union of Basic and Clinical Pharmacology. Retrieved 9 November 2018. ^ Thomas, Adèle; Stevenson, Lesley A; Wease, Kerrie N; Price, Martin R; Baillie, Gemma; Ross, Ruth A; Pertwee, Roger G (December 2005). "Evidence that the plant cannabinoid Δ9-tetrahydrocannabivarin is a cannabinoid CB1 and CB2 receptor antagonist". British Journal of Pharmacology. 146 (7): 917–926. doi:10.1038/sj.bjp.0706414. ISSN 0007-1188. PMC 1751228. PMID 16205722. ^ Pertwee, R G; Thomas, A; Stevenson, L A; Ross, R A; Varvel, S A; Lichtman, A H; Martin, B R; Razdan, R K (March 2007). "The psychoactive plant cannabinoid, Δ9-tetrahydrocannabinol, is antagonized by Δ8- and Δ9-tetrahydrocannabivarin in mice in vivo". British Journal of Pharmacology. 150 (5): 586–594. doi:10.1038/sj.bjp.0707124. ISSN 0007-1188. PMC 2189766. PMID 17245367. ^ Shao Z, Yin J, Chapman K, Grzemska M, Clark L, Wang J, Rosenbaum DM (2016). "High-resolution crystal structure of the human CB1 cannabinoid receptor". Nature. 540 (7634): 602–606. Bibcode:2016Natur.540..602S. doi:10.1038/nature20613. PMC 5433929. PMID 27851727. ^ Hua T, Vemuri K, Pu M, Qu L, Han GW, Wu Y, Zhao S, Shui W, Li S, Korde A, Laprairie RB, Stahl EL, Ho JH, Zvonok N, Zhou H, Kufareva I, Wu B, Zhao Q, Hanson MA, Bohn LM, Makriyannis A, Stevens RC, Liu ZJ (2016). 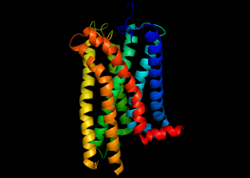 "Crystal Structure of the Human Cannabinoid Receptor CB1". Cell. 167 (3): 750–762.e14. doi:10.1016/j.cell.2016.10.004. PMC 5322940. PMID 27768894. ^ a b c d Pertwee RG (April 2006). "The pharmacology of cannabinoid receptors and their ligands: an overview". International Journal of Obesity. 30 Suppl 1: S13–8. doi:10.1038/sj.ijo.0803272. PMID 16570099. ^ Nickols HH, Conn PJ (January 2014). "Development of allosteric modulators of GPCRs for treatment of CNS disorders". Neurobiology of Disease. 61: 55–71. doi:10.1016/j.nbd.2013.09.013. PMC 3875303. PMID 24076101. ^ Nguyen T, Li JX, Thomas BF, Wiley JL, Kenakin TP, Zhang Y (November 2016). "Allosteric Modulation: An Alternate Approach Targeting the Cannabinoid CB1 Receptor". Medicinal Research Reviews. 37 (3): 441–474. doi:10.1002/med.21418. PMC 5397374. PMID 27879006. ^ a b c "Entrez Gene: CNR1 cannabinoid receptor 1 (brain)". ^ Demuth DG, Molleman A (January 2006). "Cannabinoid signalling". Life Sciences. 78 (6): 549–63. doi:10.1016/j.lfs.2005.05.055. PMID 16109430. ^ a b c d e Pagotto U, Marsicano G, Cota D, Lutz B, Pasquali R (February 2006). "The emerging role of the endocannabinoid system in endocrine regulation and energy balance". Endocrine Reviews. 27 (1): 73–100. doi:10.1210/er.2005-0009. PMID 16306385. ^ a b c d e f g h i j Elphick MR, Egertová M (March 2001). "The neurobiology and evolution of cannabinoid signalling". Philosophical Transactions of the Royal Society of London. Series B, Biological Sciences. 356 (1407): 381–408. doi:10.1098/rstb.2000.0787. PMC 1088434. PMID 11316486. ^ Price MR, Baillie GL, Thomas A, Stevenson LA, Easson M, Goodwin R, McLean A, McIntosh L, Goodwin G, Walker G, Westwood P, Marrs J, Thomson F, Cowley P, Christopoulos A, Pertwee RG, Ross RA (November 2005). "Allosteric modulation of the cannabinoid CB1 receptor". Molecular Pharmacology. 68 (5): 1484–95. doi:10.1124/mol.105.016162. PMID 16113085. ^ Navarro HA, Howard JL, Pollard GT, Carroll FI (April 2009). "Positive allosteric modulation of the human cannabinoid (CB) receptor by RTI-371, a selective inhibitor of the dopamine transporter". British Journal of Pharmacology. 156 (7): 1178–84. doi:10.1111/j.1476-5381.2009.00124.x. PMC 2697692. PMID 19226282. ^ Horswill JG, Bali U, Shaaban S, Keily JF, Jeevaratnam P, Babbs AJ, Reynet C, Wong Kai In P (November 2007). "PSNCBAM-1, a novel allosteric antagonist at cannabinoid CB1 receptors with hypophagic effects in rats". British Journal of Pharmacology. 152 (5): 805–14. doi:10.1038/sj.bjp.0707347. PMC 2190018. PMID 17592509. ^ Fan N, Yang H, Zhang J, Chen C (February 2010). "Reduced expression of glutamate receptors and phosphorylation of CREB are responsible for in vivo Δ9-THC exposure-impaired hippocampal synaptic plasticity". Journal of Neurochemistry. 112 (3): 691–702. doi:10.1111/j.1471-4159.2009.06489.x. PMC 2809144. PMID 19912468. ^ a b "OrthoMaM phylogenetic marker: CNR1 coding sequence". ^ Burns HD, Van Laere K, Sanabria-Bohórquez S, Hamill TG, Bormans G, Eng WS, Gibson R, Ryan C, Connolly B, Patel S, Krause S, Vanko A, Van Hecken A, Dupont P, De Lepeleire I, Rothenberg P, Stoch SA, Cote J, Hagmann WK, Jewell JP, Lin LS, Liu P, Goulet MT, Gottesdiener K, Wagner JA, de Hoon J, Mortelmans L, Fong TM, Hargreaves RJ (June 2007). "[18F]MK-9470, a positron emission tomography (PET) tracer for in vivo human PET brain imaging of the cannabinoid-1 receptor". Proceedings of the National Academy of Sciences of the United States of America. 104 (23): 9800–5. Bibcode:2007PNAS..104.9800B. doi:10.1073/pnas.0703472104. PMC 1877985. PMID 17535893. ^ a b c d e f Pertwee RG (January 2008). "The diverse CB1 and CB2 receptor pharmacology of three plant cannabinoids: Δ9-tetrahydrocannabinol, cannabidiol and Δ9-tetrahydrocannabivarin". British Journal of Pharmacology. 153 (2): 199–215. doi:10.1038/sj.bjp.0707442. PMC 2219532. PMID 17828291. ^ Häring M, Kaiser N, Monory K, Lutz B (2011). Burgess HA, ed. "Circuit specific functions of cannabinoid CB1 receptor in the balance of investigatory drive and exploration". PLOS ONE. 6 (11): e26617. Bibcode:2011PLoSO...626617H. doi:10.1371/journal.pone.0026617. PMC 3206034. PMID 22069458. ^ Hill MN, McLaughlin RJ, Bingham B, Shrestha L, Lee TT, Gray JM, Hillard CJ, Gorzalka BB, Viau V (May 2010). "Endogenous cannabinoid signaling is essential for stress adaptation". Proceedings of the National Academy of Sciences of the United States of America. 107 (20): 9406–11. Bibcode:2010PNAS..107.9406H. doi:10.1073/pnas.0914661107. PMC 2889099. PMID 20439721. ^ Mathison R, Ho W, Pittman QJ, Davison JS, Sharkey KA (August 2004). "Effects of cannabinoid receptor-2 activation on accelerated gastrointestinal transit in lipopolysaccharide-treated rats". British Journal of Pharmacology. 142 (8): 1247–54. doi:10.1038/sj.bjp.0705889. PMC 1575196. PMID 15249429. ^ De Luca MA, Solinas M, Bimpisidis Z, Goldberg SR, Di Chiara G (July 2012). "Cannabinoid facilitation of behavioral and biochemical hedonic taste responses". Neuropharmacology. 63 (1): 161–8. doi:10.1016/j.neuropharm.2011.10.018. PMC 3705914. PMID 22063718. ^ a b Varga K, Wagner JA, Bridgen DT, Kunos G (August 1998). "Platelet- and macrophage-derived endogenous cannabinoids are involved in endotoxin-induced hypotension". FASEB Journal. 12 (11): 1035–44. doi:10.1096/fasebj.12.11.1035. PMID 9707176. ^ Sidhpura N, Parsons LH (December 2011). "Endocannabinoid-mediated synaptic plasticity and addiction-related behavior". Neuropharmacology. 61 (7): 1070–87. doi:10.1016/j.neuropharm.2011.05.034. PMC 3176941. PMID 21669214. ^ Puente N, Cui Y, Lassalle O, Lafourcade M, Georges F, Venance L, Grandes P, Manzoni OJ (November 2011). "Polymodal activation of the endocannabinoid system in the extended amygdala". Nature Neuroscience. 14 (12): 1542–7. doi:10.1038/nn.2974. PMID 22057189. ^ Mclaughlin PJ, Delevan CE, Carnicom S, Robinson JK, Brener J (August 2000). "Fine motor control in rats is disrupted by delta-9-tetrahydrocannabinol". Pharmacology Biochemistry and Behavior. 66 (4): 803–9. doi:10.1016/S0091-3057(00)00281-1. PMID 10973519. ^ Pietr MD, Knutsen PM, Shore DI, Ahissar E, Vogel Z (November 2010). "Cannabinoids reveal separate controls for whisking amplitude and timing in rats". Journal of Neurophysiology. 104 (5): 2532–42. doi:10.1152/jn.01039.2009. PMID 20844105. ^ a b De Vries TJ, Schoffelmeer AN (August 2005). "Cannabinoid CB1 receptors control conditioned drug seeking". Trends in Pharmacological Sciences. 26 (8): 420–6. doi:10.1016/j.tips.2005.06.002. PMID 15992935. ^ a b Wiskerke J, Pattij T, Schoffelmeer AN, De Vries TJ (June 2008). "The role of CB1 receptors in psychostimulant addiction". Addiction Biology. 13 (2): 225–38. doi:10.1111/j.1369-1600.2008.00109.x. PMID 18482432. ^ a b c Melis M, Pistis M (December 2012). "Hub and switches: endocannabinoid signalling in midbrain dopamine neurons". Philosophical Transactions of the Royal Society of London. Series B, Biological Sciences. 367 (1607): 3276–85. doi:10.1098/rstb.2011.0383. PMC 3481525. PMID 23108546. ^ Lopez-Rodriguez AB; et al. (1 January 2015). "CB1 and CB2 cannabinoid receptor antagonists prevent minocycline-induced neuroprotection following traumatic brain injury in mice". Cereb. Cortex. 25 (1): 35–45. doi:10.1093/cercor/bht202. PMID 23960212. ^ Leggett JD, Aspley S, Beckett SR, D'Antona AM, Kendall DA, Kendall DA (2004). "Oleamide is a selective endogenous agonist of rat and human CB1 cannabinoid receptors". Br J Pharmacol. 141 (2): 253–62. doi:10.1038/sj.bjp.0705607. PMC 1574194. PMID 14707029. ^ Laprairie RB, Kulkarni PM, Deschamps JR, Kelly ME, Janero DR, Cascio MG, Stevenson LA, Pertwee RG, Kenakin TP, Denovan-Wright EM, Thakur GA (February 2017). "Enantiospecific Allosteric Modulation of Cannabinoid 1 Receptor". ACS Chemical Neuroscience. 8 (6): 1188–1203. doi:10.1021/acschemneuro.6b00310. PMID 28103441. ^ a b Pertwee RG, Howlett AC, Abood ME, Alexander SP, Di Marzo V, Elphick MR, Greasley PJ, Hansen HS, Kunos G, Mackie K, Mechoulam R, Ross RA (December 2010). "International Union of Basic and Clinical Pharmacology. LXXIX. Cannabinoid receptors and their ligands: beyond CB₁ and CB₂". Pharmacological Reviews. 62 (4): 588–631. doi:10.1124/pr.110.003004. PMC 2993256. PMID 21079038. ^ a b "PDSP Database – UNC". Archived from the original on 8 November 2013. Retrieved 11 June 2013. ^ Frost JM, Dart MJ, Tietje KR, Garrison TR, Grayson GK, Daza AV, El-Kouhen OF, Yao BB, Hsieh GC, Pai M, Zhu CZ, Chandran P, Meyer MD (January 2010). "Indol-3-ylcycloalkyl ketones: effects of N1 substituted indole side chain variations on CB(2) cannabinoid receptor activity". Journal of Medicinal Chemistry. 53 (1): 295–315. doi:10.1021/jm901214q. PMID 19921781. ^ a b Aung MM, Griffin G, Huffman JW, Wu M, Keel C, Yang B, Showalter VM, Abood ME, Martin BR (August 2000). "Influence of the N-1 alkyl chain length of cannabimimetic indoles upon CB(1) and CB(2) receptor binding". Drug and Alcohol Dependence. 60 (2): 133–40. doi:10.1016/S0376-8716(99)00152-0. PMID 10940540. ^ Aung MM, Griffin G, Huffman JW, Wu M, Keel C, Yang B, Showalter VM, Abood ME, Martin BR (August 2000). "Influence of the N-1 alkyl chain length of cannabimimetic indoles upon CB(1) and CB(2) receptor binding". Drug and Alcohol Dependence. 60 (2): 133–40. doi:10.1016/s0376-8716(99)00152-0. PMID 10940540. ^ Murphy WJ, Eizirik E, Johnson WE, Zhang YP, Ryder OA, O'Brien SJ (February 2001). "Molecular phylogenetics and the origins of placental mammals". Nature. 409 (6820): 614–8. doi:10.1038/35054550. PMID 11214319. ^ Blanga-Kanfi S, Miranda H, Penn O, Pupko T, DeBry RW, Huchon D (April 2009). "Rodent phylogeny revised: analysis of six nuclear genes from all major rodent clades". BMC Evolutionary Biology. 9: 71. doi:10.1186/1471-2148-9-71. PMC 2674048. PMID 19341461. ^ DeBry RW (October 2003). "Identifying conflicting signal in a multigene analysis reveals a highly resolved tree: the phylogeny of Rodentia (Mammalia)". Systematic Biology. 52 (5): 604–17. doi:10.1080/10635150390235403. PMID 14530129. ^ Janecka JE, Miller W, Pringle TH, Wiens F, Zitzmann A, Helgen KM, Springer MS, Murphy WJ (November 2007). "Molecular and genomic data identify the closest living relative of primates". Science. 318 (5851): 792–4. Bibcode:2007Sci...318..792J. doi:10.1126/science.1147555. PMID 17975064. "Cannabinoid Receptors: CB1". 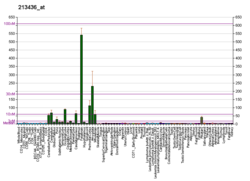 IUPHAR Database of Receptors and Ion Channels. International Union of Basic and Clinical Pharmacology.